Venture capitalists (VCs) are looking to capitalize on the growing demand for online retailing, especially in the Asia-Pacific (APAC) region, which can be attributed to the increasing use of smartphones coupled with growing internet penetration, according to leading data and analytics company GlobalData. 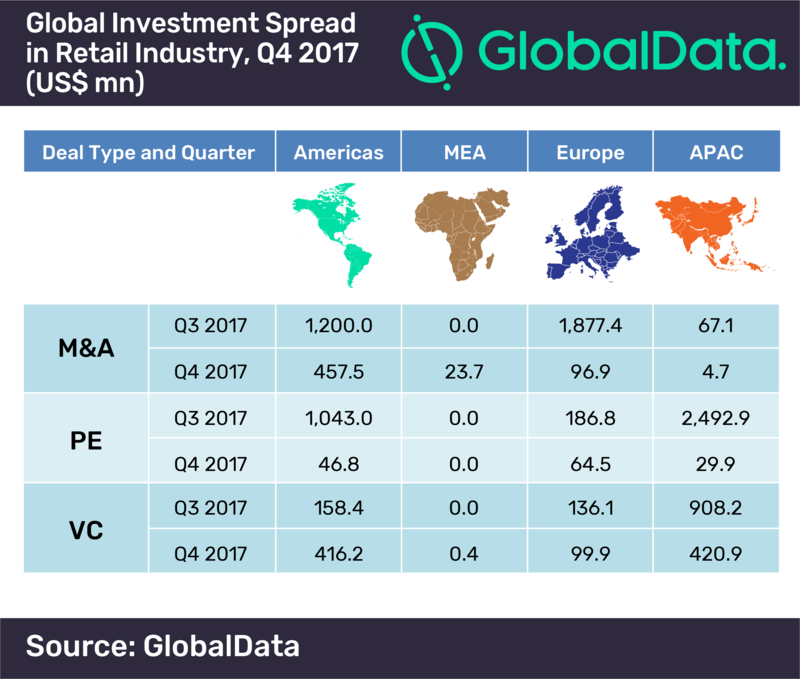 The company’s latest report, ‘Smart Money Investing in the Retail Industry in Q4 2017’, says that despite a 4% drop in the share of VC funding deals from 49% in Q3 2017, APAC region still accounted for $420.9m of the total investments ($937.3m) across the globe during the reporting period. Vijay Varma, Retail Market Analyst at GlobalData says: “Venture capitalists are leveraging the growing demand for online retailing, especially in the APAC region. The funding is being utilized by online retailers to broaden their reach and introduce new product categories along with expanding their reach into other countries.” For instance, Pomelo Fashion Co., Ltd., an online apparel retailer based in Thailand, secured USD19 million in Series B round of funding led by JD.com, Inc. to expand its reach and product portfolio. GlobalData’s analysis on sector-wise investments also reveals that in APAC, the majority of VC funding is focused on food and grocery (F&G) sector, in line with growing consumer preference for packaged foods along with increasing demand for organic/natural products. For instance, Prompt Care, Inc. (UrFresh), a Chinese fresh produce e-commerce company that delivers fresh produce items in an hour, secured USD15 million in Series B+ funding led by Haier Capital. The M&A activity took a dip in Q4 2017 compared to Q3 2017. The Americas region dominated the M&A deals accounting for 78.5% of the total M&A value in Q4 2017, while the APAC region accounted for less than 1% of the total value. Geographic and product portfolio expansion were the key motives behind M&A activity for retailers. Several retailers such as Supervalu aim to make use of the distribution network of the acquired firms to reduce operational and investment costs. Within APAC, the key M&A activity centred around home and lifestyle firms such as the Nuance Group acquisition of 40% Stake in Nuance Group (India) from Shoppers Stop and Best World International acquisition of 22.5% additional stake in Best World Lifestyle. Most of the PE investments were focused on companies planning to expand store base and product offerings. Particularly in APAC, majority of the investments were centred around online food & grocery and niche lifestyle brands. For instance, Indian designer led lifestyle retailer Chumbak secured a $13 million investment led by Gaja Capital with an aim to increase both its online and offline presence along with foraying into personal care segment. Another Indian online food & grocery retailer BigBasket secured $5 million investment from Helion Ventures Partners III to strengthen its warehouse network and cold chain set ups in the country.